Hardly had the dust over the rift between Peter of P-Square and his brothers Paul and Jude settled when the iconic music family is faced with another messy story, bothering on alleged breach of contract. Residents of Omole Estate, Lagos woke up Friday morning to the invasion of the Square Villa, home of Psquare, by policemen purportedly carrying out a court order to reclaim about N8million said to have been paid to P-Square for a show they eventually turned down. Although the group neither showed the court injunction to the NET correspondent nor revealed the name of the client, an eye witness said the singers appeared beaten by the situation which attracted a mammoth crowd to their residence. Paul was seen driving out of the Sqaure Ville in a tinted BMW, refusing to speak to anyone. There were indications the singer was going to sort out the refund rather than allow further molestation. This latest saga in the career of the musical mega stars is coming on the heels of the purported sack of the duo's manager as well as elder brother Jude Okoye. For the 16 years since the dynamic duo hit the limelight, they have been managed by Jude. An obviously angry Pe­ter expressed his frustration working with Jude before finally sacking him. 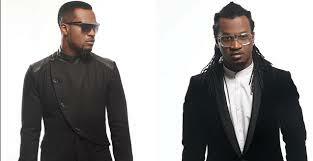 Peter insisted in his tweets it was wrong for Jude to insist that he must remain P-Square’s man­ager, reiterating that his decision was final. In response, Jude tweeted that Peter needed help. He added that for over four years, he had been managing Jude and his an­tics but now was the time to take action. “I have been nurturing and managing these prob­lems for over four years now. Don’t take my silence as a weakness,” he added. However, Peter was not done. He added a dis­claimer stating that who­ever does business with Jude does so at his/her own risk: “Please, whosoever makes any transaction with Northside Entertainment or Jude Okoye on P-Square’s behalf does so at his/her own risk.